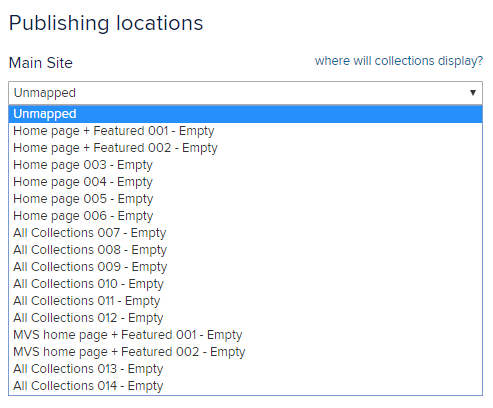 When you create or edit a collection in Marketplace, you'll be prompted to choose one or more publishing locations for it. These publishing locations determine where the collection will appear on your OverDrive site. There are 6 total spaces for collections on your home page. Your Account Manager may fill the first 3 spaces with auto-generated collections (like "Most Popular" or "New Additions"). You can publish curated collections to the last 3 spaces using the "Home page + Featured Collections" slots under the "Main Site" drop-down. If your Account Manager filled any of the last 3 spaces with auto-generated collections, they will be overwritten when you publish curated collections. Curated collections published to the home page will automatically appear in the Featured Collections list in your site's Menu. You can publish an additional curated collection directly to the Featured Collections list (for a total of 4 featured collections) using the "Featured Collections 004" slot under the "Main Site" drop-down. If you don't have 4 curated collections in the Featured Collections list, auto-generated collections will fill in any empty slots. Any curated collections in the Featured Collections list will also appear on the All Collections page. You can publish up to 8 additional curated collections to the All Collections page using the remaining "Featured Collections" slots. All auto-generated collections will also display in the All Collections page, above any curated collections. If your library has eReading rooms, you can publish collections to them separately from your main site. You can publish up to 5 curated collections on each room's home page, and up to 100 more in the room's Collections menu. You can publish up to 5 curated collections on your home page using the "Main home page" drop-down. Up to 5 auto-generated collections (created by your Account Manager) may also appear on the home page. Auto-generated collections will display below your published curated collections. 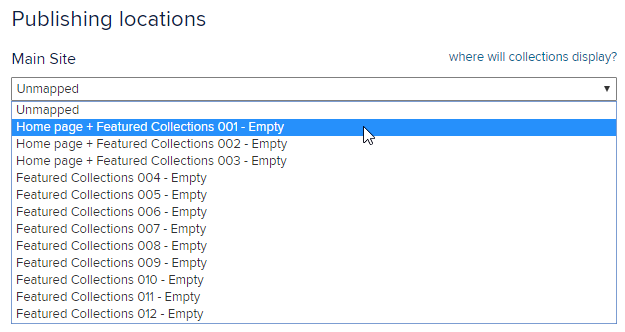 You can publish up to 100 collections to your Collections menu using the "Main collections menu" drop-down. If you publish 6 or more curated collections to this menu, the Collections header on your site will be a button that takes you to a page with all of your curated collections. If you publish 5 or fewer curated collections to this menu, the Collections header on your site will be a drop-down menu that also includes your auto-generated collections. You can publish up to 100 collections to an optional Curriculum menu using the "Main curriculum menu" drop-down. If you don't publish any collections to your Curriculum menu, it won't appear. If your school has eReading rooms, you can publish collections to them separately from your main site. Each eReading room has its own home page, Collections menu, and optional Curriculum menu. You can publish up to 8 curated collections on your home page using any slot with "home page" in its name. 6 of these can be regular collections. 2 of these can be multi-volume set (MVS) collections. The 2 MVS curated collections will publish above your regular collections. Your Account Manager may create automated collections for your home page on your behalf. If you don't publish curated collections to all 8 slots on your home page, your Account Manager can fill these slots with automated collections. Your Account Manager can also publish 2 MVS automated collections on your home page, in addition to the 8 slots for curated collections. These will publish below any curated collections. You can publish up to 4 collections to the Featured Collections list in your site's Menu using any slot with "Featured" in its name. The first 2 collections in the Featured Collections list are for curated MVS collections. The last 2 are for regular curated collections. All collections on your site (up to 18 total) will publish to the All Collections page. Collections published to an "All Collections" slot will only appear on the All Collections page.